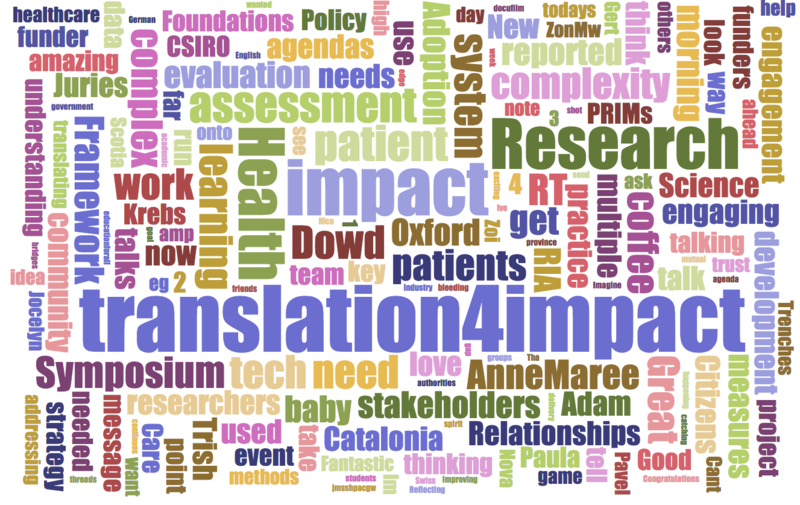 Impact has become a key concept for health research and a vibrant international community of practice and growing infrastructure has emerged across different research systems, which seeks to address the challenge of how to evaluate the social and economic effects of health research. This diversity was reflected in a recent international symposium, which brought together; funders, researchers, clinicians, program managers, policy stakeholders and data platform providers, to present, share, and critically appraise frameworks, to develop their impact evaluation practices. Despite speakers presenting on a wide variety of health research impact frameworks from diverse national and regional contexts, three common themes and tensions emerged; complexity, community and continuity. A recurrent theme of the symposium was the challenge of accounting for complexity in health research systems that are defined by multiple, interdependent parts that evolve in non-linear ways and generate unexpected outcomes. In her keynote on the Nonadoption, Abandonment, Scale-up, Spread, and Sustainability (NASSS) Framework, Trish Greenhalgh called for an embrace of narratives among impact researchers and practitioners. Greenhalgh argued that it is only it is only through telling stories that frameworks such as NASSS and others can help to explain the problems faced in evaluating research impact. Mixed methods evaluations were also seen as essential to contextualise and make relevant various quantitative indicators (responsible metrics) that have emerged in recent times to track and measure impact. This however requires constant innovation in data collection methods and analysis. In contrast, Gert Balling from Denmark’s Novo Nordisk Foundation explained why funders require consistent user-friendly data platforms to ensure effective monitoring and evaluation of the research they fund. Ensuring digital platforms support impact evaluation, while minimising administrative burden, is likely to be an ongoing tension in this area. However, the Novo Nordisk Foundation’s work in creating a dedicated department for research impact assessment and adapting the Researchfish data collection platform, provides a promising example of how these diverging interests might be reconciled. A further matter of concern was that impact assessment should be meaningfully co-produced between researchers, funders, and other stakeholders (including patients) – not an empty verification ritual bolted on at the end of projects. In this spirit, Paula Adam from Catalonia’s Agency for Health Quality and Assessment (AQuAS) described the sistema d’avaluació de la recerca i innovació en salut (SARIS) framework, an ongoing research impact assessment exercise that provides both summative (previous impacts) and formative (preparing and promoting contexts for better impacts) evaluations. Inspired by the Productive Interactions framework, SARIS provides a non-linear approach to assessing the impact of research which emphasises co-produced values above rigid predefined metrics. Anne-Maree Dowd from Australia’s governmental Commonwealth Scientific and Industrial Research Organisation (CSIRO), also asked researchers to think in terms of adoption pathways and getting other stakeholders to adopt their ‘research babies’. Sharing examples of best practice from CSIRO’s impact strategy, she encouraged the audience to appreciate the careful work and level of commitment needed to ensure new research products aren’t prematurely orphaned or neglected. Finally, Mark Taylor from the UK’s National Institute of Health Research (NIHR) set out citizen juries as a potential engagement platform for linking health research to the needs of an ageing population. Taylor pointed to how the use of such juries in the Irish abortion referendum, was instrumental to developing the multiple scenarios that were used to map out the complexities that implementing the policy would likely entail. A third challenge for funders is not simply to fund research projects, but also to ensure that the innovations they develop are scaled-up and put into practice. Reviewing the success of the Partnership for Research and Innovation in the Health System (PRIHS) framework in Canada, Kathryn Graham and Maxi Miciak, argued a “stage gate” decision model, whereby funders review completed grants to fund additional scale-up and sustainability work, is a valuable model for achieving this. An added advantage of PRIHS was that it positioned research as an economic asset to the healthcare system, rather than a cost driver. The Netherlands Organisation for Health Research and Development (ZonMW), provided another case of best practice, as Barbara van der Linden and Wendy Reijmerink showcased ZonMW’s dedicated implementation programs, which account for 10% of their funding portfolio. In committing such significant funding to implementation, ZonMW will likely be seen as a benchmark for other European research funders. In spite of the success of these individual initiatives, the symposium left us with the impression there is still scope development in the field of health research impact. In particular, we argue that what is needed now, is not yet more new frameworks, but a critical understanding of questions such as; “what do funders and the stakeholders they represent value in research?”, “what mechanisms do they believe can support or inhibit such value being created?”, and “what processes and tools they use to evidence and communicate impact?” Such a direction, would furnish existing frameworks, which primarily give us accounts of what to know, with greater reflexivity and increase awareness of know-how, which can be used to support the work of practitioners. Alex Rushforth is post-doctoral researcher in the Nuffield Department of Primary Care Health Sciences, University of Oxford. He is a sociologist with interests in health research systems, research evaluation, and digital health. Prior to his current role, he was at the Centre for Science and Technology Studies, Leiden University, looking at the rise of performance indicators in managerial and evaluation contexts, accountability, audit cultures, and new public management. Adam Kamenetzky is a Senior Research Fellow for the UK’s National Institute for Health Research (NIHR). His work with NIHR focusses on applying social research methods to improve organisational learning: specifically, NIHR’s efforts to understand, support and evidence the wider impacts of over £1 billion annual investments in UK health and social care research. This work builds on a portfolio of original research, commissioned studies and co-designed workshops, training activities and communications designed to help research funding organisations answer questions on the ‘science of science’, research policy and impact.